Tony Amaradio is the Founder and Chief Strategist of Select Portfolio Management, Inc. His career in the financial services industry began after completing his undergraduate studies at the University of Michigan and his MBA at the University of Detroit with a concentration in finance and taxes. He quickly earned a reputation for achievement and generating results which led to the launching of his own firm over 30 years ago. For the last several years Tony has followed a passion of devoting a third or more of his time to philanthropy and non-profit ministries. He is the creator of a Legacy Model designed for high-net worth clients whose goal it is to be faithful in stewarding resources to support non-profit organizations and ministries. Tony is often called on to be a guest speaker and travels the country helping major donors improve their ability and capacity to be faithful with their resources through consultations for investment and investment planning. Today, Select Portfolio Management Inc. serves thousands of clients and Tony, along with his team is the architect and the implementer of many advanced strategies of financial, tax and asset protection plans available today. Southern California has been home to Tony and Carin since 1987 and attend Crossline Community Church. After graduating from Michigan State University and a brief career in retail management Carin joined the financial services industry in 1979. She is President and the Chief Compliance Officer for Select Portfolio Management Inc. and its broker dealer, Securities Equity Group. For the last several years Carin’s focus has been on the compliance and operations area in the firm and has advanced the firm’s capability and capacity with a persistent push for process improvement, cohesive team operations and enhanced technology. Carin has been Tony’s partner and a driving force in developing the infrastructure that supports their thriving business. 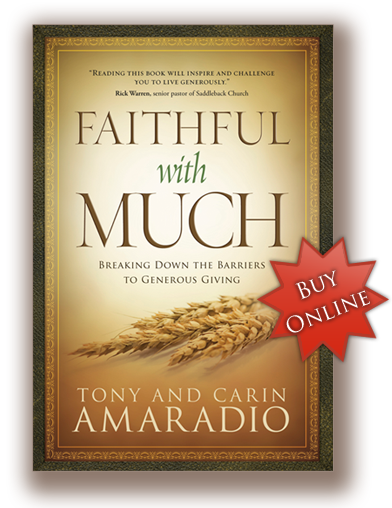 Carin joins Tony in a passion for encouraging and teaching others in the area of charitable giving and often joins the stage with Tony speaking at conferences on the topic of stewardship. Carin speaks to the heart and personal experience part of giving, leaving the technical part to her husband. She is motivated by helping others understand the joy and passion of faithful giving. Perhaps her most passionate pursuit is that of family and being a mom.